The Trappeur Villas townhomes for sale are located at about 7 o’clock on the loop called Columbine Drive in the Four Seasons section of the Warriors Mark neighborhood. The base of Peak 9 of the Breckenridge Ski Resort is just across the Blue River from Tappeur Villas, and is a quick hike in the summer or a short skate along packed trails in the winter. Trappeurs Villas were built in the late nineteen seventies and have a slightly modern, but still woody exterior, are larger than other condos in the immediate vicinity and have balconies and big windows that look out over the Blue River, with views of the Ten Mile Range. The free town shuttle stops along the Columbine Loop and makes everything in Breckenridge easily accessible from any of these town homes. 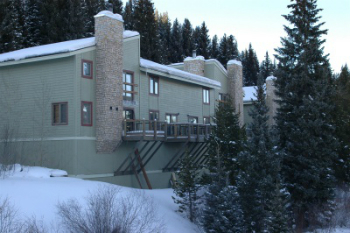 Discover the available Trappeur Villas Townhouse listings below, or get more information about this stunning Breckenridge development. Fishing is a privilege of homeownership in the Warriors Mark neighborhood, and right out the door for homeowners of Trappeur Villas townhouses. The homes overlook the Blue River, and fishing on this section have been known to yield some real lunkers, all native, since stocking doesn’t affect this stretch. Getting across the river to the Quicksilver lift is easy – winter or summer – and several trails into the national forest begin in this area. Downtown Breckenridge is equally close, just a block to the north. Size: 1154 to 1498 sq. ft. Amenities: close to Peak 9, easy walk to town, on the bus route. Located on Broken Lance in Warriors Mark, across the Blue River from the base of Peak 9. Drive south on Main Street to last stoplight at Boreas Pass Road, turn right on Broken Lance Drive. At the three-way stop make a left and remain on Broken Lance, and at the second intersection turn right. Broken Lance is a long lariat loop and this intersection is where it returns to join itself. Cross the Blue River and Trappeur Villa Townhomes will be on the right, just past Spruce Island. Do you have any questions about Breckenridge real estate? Send us a message, or call us at (970) 453-2200 to get the conversation started.